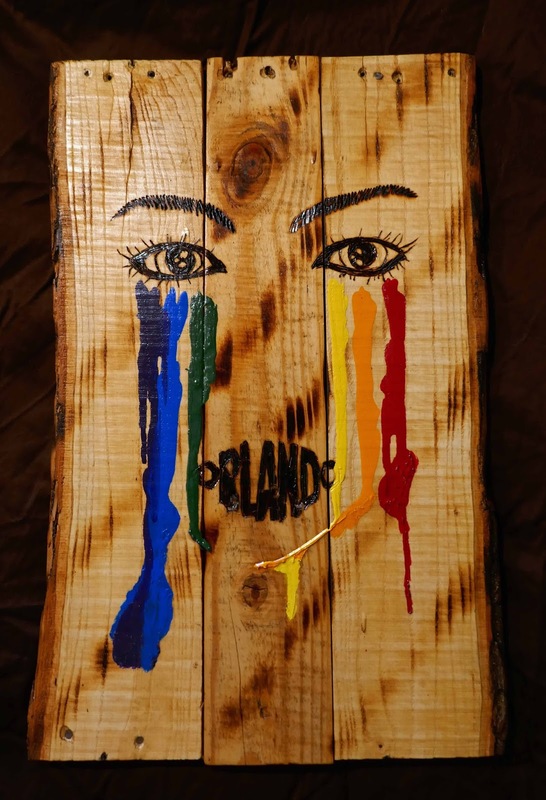 As with some of the earlier pieces posted here, this is made from reclaimed pallet wood. 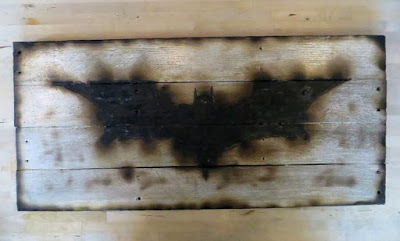 I first painted the wood white and then outline the bat with a wood burning tool. 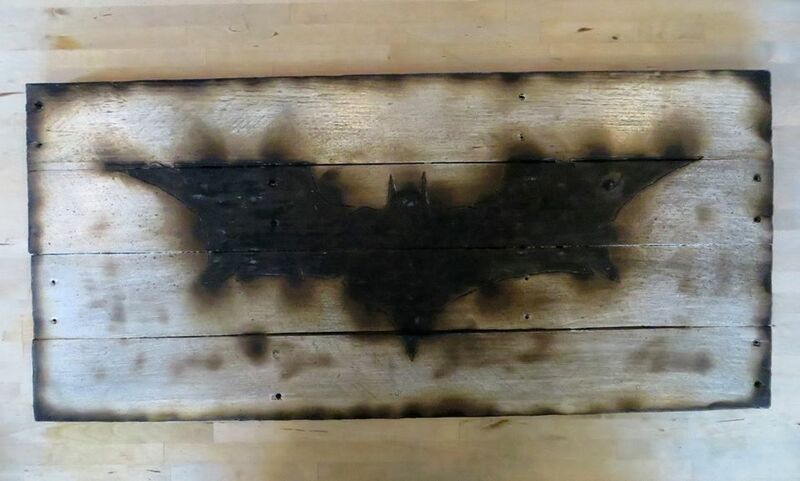 The remainder was created using a torch. As I coated the piece with urethane... to seal the ash so that it doesn't get all over people... I was pleasantly surprised in the way the ash spread across the entire piece adding more texture to it and changing the color to a more brownish/off white. This is one of my more favorite pieces. 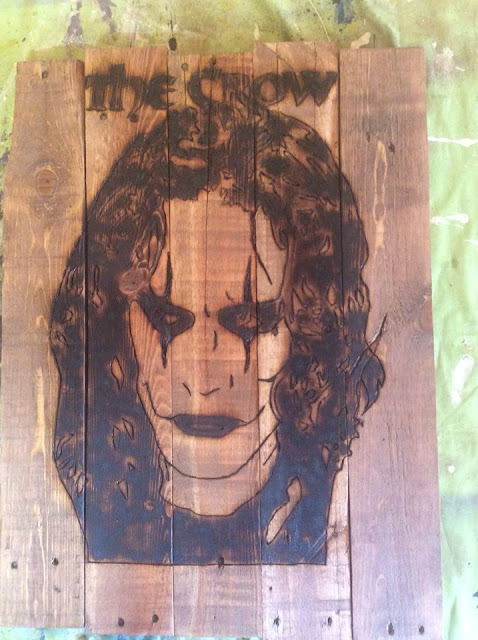 Of course that has a lot to do with my love for the move, The Crow. It's made on stained pallet wood. 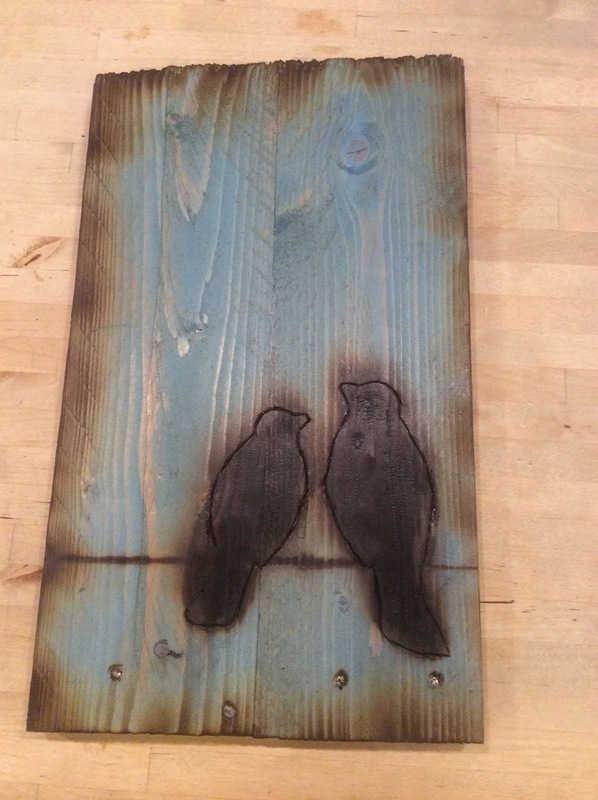 The design is outline using a wood burning tool. The rest of it, however, was made using a regular torch. You can see from other pieces here that this is something I've really gotten into.... always loved playing with fire... and I'm continuing to explore different ways to use fire to create art. I wanted to do the Balloon at Night to have something a bit lighter in the collection. Similarly to the Birds on a Wire I do some time back, also pictured below. The Balloon is painted with acrylic paints that have been watered down, as are the clouds at the bottom. 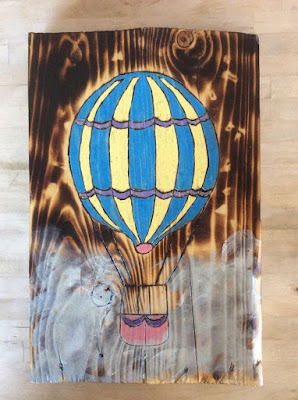 The Balloon is outlined using a wood burning tool. 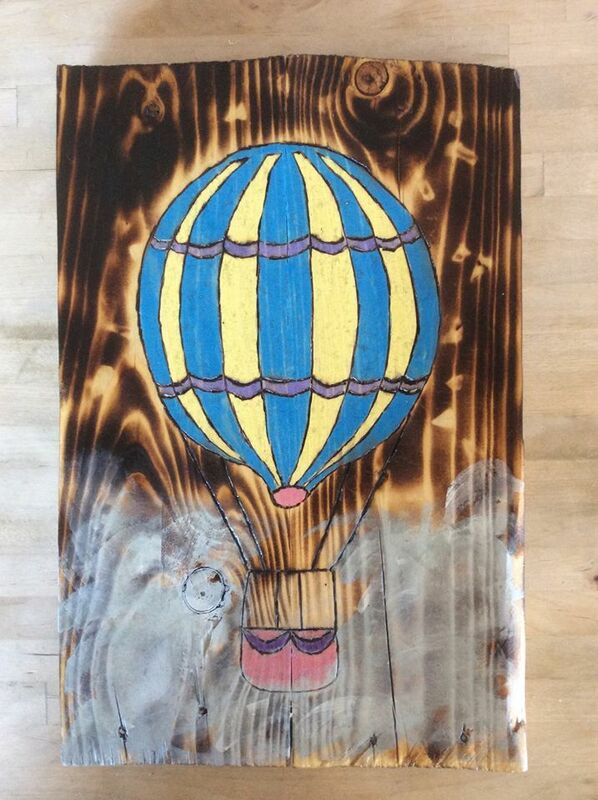 The dark area around the balloon was burnt using a regular torch. 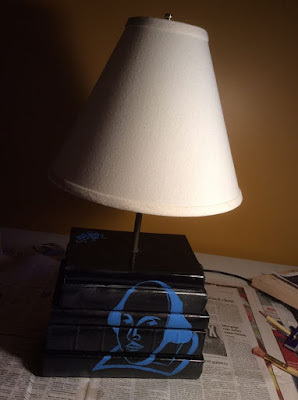 I finished it with a urethane coating. The Birds on a Wire were created in a similar fashion, except in the opposite way with the birds being the piece burnt with a torch. 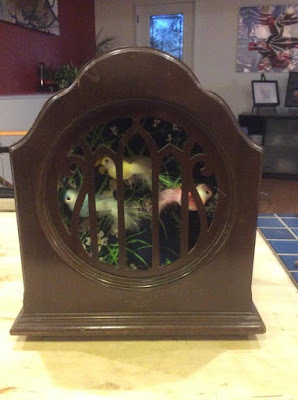 The shell for Songbird Radio was given to me by the director at Bucktown Center for the Arts director's gallery where I display my work. 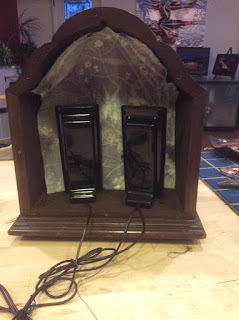 It was already a hollow radio with the inside workings missing. I had a little fun with this one, hanging songbirds in the front with a curtain behind them. There are speakers in the back to plug in your phone or ipod... so it is an actual working piece. The back is simply attached with Velcro so it is easy to get into the radio and reach the speakers. 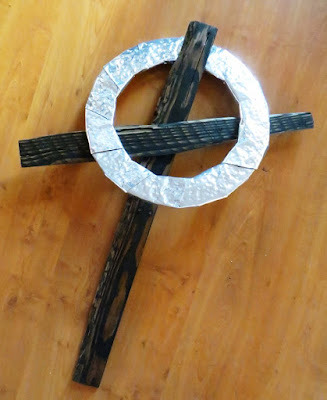 The Old Rustic Cross is made from old pallet wood that I stained with an ebony stain. It is larger than it appears, the vertical board is close to three foot long. The halo is made from wood that is wrapped in recycled aluminum cans that I then dented with a hammer.